"We have used Gary over the years on a number of occasions for different jobs. he has been reliable, honest and completed all work to a high standard. We would not hesitate to recommend him"
I have found Gary good to deal with and the work he has done has been very satisfactory. We have used Gary's services on several occasions and been very happy with the work. He has put in new window cills for us, laid a wooden floor in our lobby (which included joists) and several other jobs. We found the work to be done well and he always cleans up the area when he's finished. Another good point is he is consistently punctual - something you don't always find when your fixing up appointments. But one to be welcomed! I wouldn't hesitate to recommend Gary and have indeed already done so with close neighbours. I had several internal door handles fixed around my home a few months ago by AGM Joinery Services. I found Gary to be very professional and the standard of work was completed to a very high standard. I would recommend everyone to this Joinery Service. The services Gary provided were to a very high standard , he had excellent time keeping and was also very tidy. I would utilise his services again. Gary was recommended to us by our friends who he had done some work for. He has designed, constructed and fitted our alcove shelves, which have been admired and copied by others. Gary provides a prompt, reliable service at a reasonable price. we would certainly call upon him again.
" 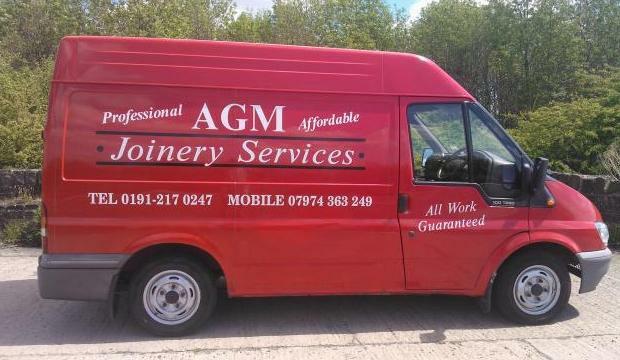 It was a pleasure to find Gary of AGM Joinery Services Ltd, who is able to offer constructive and imaginative advice in respect of home improvements and has the experience to overcome inevitable unforseen problems which arise when undertaking such projects. Thank you AGM Joinery Services Ltd for a job well done"
Gary has Carried out a range of work in our home, from wardrobes to purpose built-in wardrobes and purpose built CD racks. Always great quality at a fair price, we can definitely recommend him. 'I contacted AGM Joinery Services Ltd for some internal woodwork I required in the property of a relative. Gary was contacted via a local joinery directory and was extremely prompt in arranging a visit and subsequent quotation. Upon engaging Gary for the work he was very flexible in his availibility. As the property was vacant and unoccupied I was able to trust Gary to do the work unsupervised and at my convenience which was crucial given my circumstances. Gary offered solutions to the fitting of internal doors and locks which was very helpful. the standard of workmanship was of a very high standard and his level of professionalism could not be faulted. A credit to his profession and a job well done. I would recommend Gary for any joinery work to anyone who asks'. Gary has carried out several pieces of work for me over over the last few years. These jobs have included changing locks, tiling, joinery of different kinds and various repairs. I have found the standard of his work excellent and he is acomplished in what he does. He is efficient and completes work without cutting corners. I have every confidence in Garys workmanship and will continue to seek his help whenever necesary. We have called upon Gary several times asking him to do a number of items of joinery work in our house. He always carried out this work with skill and professionalism and we fully intend to invite him again in the near future with other jobs in mind. Without hesitation we strongly recommened to potential clients. "I found Gary very reliable, clean, reasonable priced, all work finish to a very high standard - A Master Craftsman!" Gary has done work for me for a few years. All of which I have been absolutely delighted with. I have found him to be a skilled and experienced craftsman. He is helpful as well as knowledgeable, able to offer suggestions to improve the job in progress. He always arrives when arranged and wants to make the very best of whatever work is in hand. A local joiner to be relied upon, Gary provides a first class all round service. A very efficient professional service provided by AGM Joinery Services. I would certainly use their services again. I particularly liked the detailed estimate and direct payment online facility. This made everything clear and easy. "As a customer of AGM Joinery services I am delighted with the work which Gary has undertaken on my behalf - he is professional in his approach, with excellent craftsmanship skills. Reliable and conscientious, Gary never fails to turn up on the day. He is always on time and he has a strong sense of customer service which was apparent from the moment he arrived. Well worth the fees in my opinion and would gladly call on him again without hesitation". Gary has done a lot of work for me over several years and I have been delighted with the work, and his reliability. I have no reservations in recommending him for quality, reliability and value for money. Delighted with the bespoke wardrobe Gary designed and built for us. A quality job. Would certainly use AGM again. Gary has done several pieces of work over the years including a fitted bookcase, built-in bedroom cupboard and most recently, a total kitchen replacement. We have found his work to be of high quality which has stood the test of time and the test of many childrens hands and feet. Gary has done several jobs for us and we have always been delighted with the high quality of his work and the professionalism of his approach. He is punctual and dependable over keeping appointments, carrying out work to customers specifications and seems genuinely anxious to ensure complete satisfaction with the result. Gary Macdonald is a true craftsman and a real professional. He works to the highest standard and is totally reliable and trustworthy. Whether he is doing a large or small job the quality of his work is excellent.